We still can’t believe our luck. 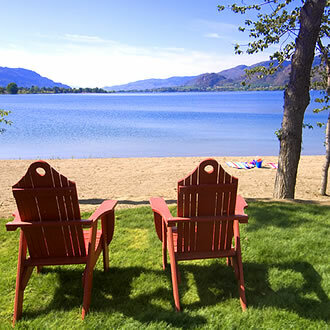 Somehow, Veranda Beach lay undiscovered for all these years on Lake Osoyoos - yet it's only minutes from Osoyoos and a short drive from both Seattle and Vancouver. We felt like world-famous archaeologists unearthing a rare treasure... and now we are delighted to be able to share it with you. The vision began by reminiscing events of the 1950’s – an age of innocence and simplicity. Think back to the family vacations you had as a child. Remember kicking your shoes off and going barefoot in the sand? The sound of a screen door slamming shut? How about the thrill of getting up on water skis for the first time? Or how you could hardly wait to see your summertime friends again? If you recall those family vacations, then you already understand our vision. The cottages at Veranda Beach capture that nostalgic spirit of freedom and unbridled optimism. Whether you choose one of our nostalgic Lakeside Cottages just steps from Veranda's sandy beach or the tranquility of a Vineyard Cottage nestled amongst our grape vines, you are about to enjoy an experience like no other. Each cottage stands alone with its oversized completely screened veranda for the ultimate in indoor/outdoor living. Fabulously appointed by our award winning designer, each cottage embraces modern comforts while maintaining a casual, cozy and classic style. Veranda Beach is about having a place to get away and become so completely relaxed you forget what day it is. A place where families and friends meet, spend time together, share laughter and create memories that will last a lifetime. Veranda Beach is the absolute perfect place to escape the everyday. Barefoot a mile of sandy beach along the calm waters of Veranda's bay - perfect for wake boarding and water skiing. Veranda Beach offers boat moorage and plenty of water toys for rent including sea doos, electric chaise lounges and paddle boats. The Village Center is the heart of Veranda Beach. Hook up with friends on the boardwalk, at the pool, over a milkshake at our fabulous 50s-style diner, or discover a bargain at the Veranda Beach General Store. And let's not forget the newest addition to Veranda Beach - wine! The beauty of Veranda’s vineyard awaits you complimented by an outstanding wine program, exclusive wine tastings, Winemaker’s Dinners and reserve selections, and the rare opportunity to vacation or own in a working vineyard with our newly released Vineyard Cottages. The Veranda Beach Crew offer a variety of activities and events through the season. Take in as much, or as little as you want, your day is up to you! But most of all you will love the friendly neighborly atmosphere of our resort community.